Ports and harbors are good candidates for video surveillance systems, but they have tough requirements. The atmosphere is corrosive, there are lots of wild animals, and everything is constantly in motion. A typical port might consist of a recreational boat harbor, a commercial fishing dock, a boat repair yard, and a collection of leased properties occupied by local businesses. The common denominator is that there is a large physical area to cover and a lot of high value property to protect. The challenge for the system integrator is to design for an unusually tough environment. The following sections will address some of the major considerations. Salt is brutal on unprotected metal and wood. Cutting corners on low cost enclosures increase risk significantly. Use IP66 or 67 rated enclosures. Vandal resistant housings are recommended for all locations, since they are usually made of coated aluminum, rather than thin plastic or painted steel. Unitized cameras are a very good choice for the coast. 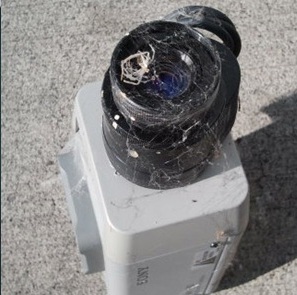 Bullet cameras and speed domes with integrated housings tend to have better seals against moisture and insects than box cameras in external housings. All hardware (screws and bolts) should be stainless steel. Galvanized steel is good for building mounts, but will rust when cut or drilled. Polyurethane NEMA boxes are recommended if vandalism is not a problem. Zinc plated screws will fail or become non-serviceable within a short time. Painted steel enclosures (typical of non-NEMA rated electrical boxes) may last for a couple of years, but are also not recommended. Note that these are only guidelines – sometimes even good quality gear will fail the test of time. 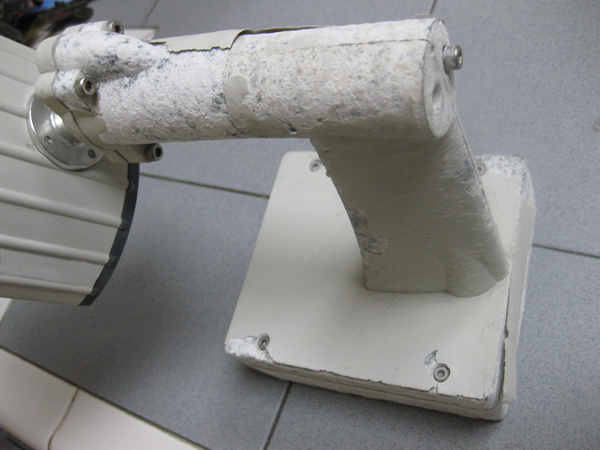 In the picture below, an expensive unitized camera failed after only three years because corrosion found a small crack in the powder-coated aluminum housing and ran underneath the paint for the entire length of the base. Once inside the camera, corrosion rapidly destroyed the contact terminals leading to intermittent outages. Large distances with no connectivity between buildings frequently mandates wireless connections. However, ports often have significant wireless networking already operational, including consumer wireless in the 2.4 GHz spectrum. Selecting one of the Public Safety frequencies eliminates interference with other wireless sources, but requires obtaining a special license. Because of that, the unlicensed 5.8 GHz. band is a common choice. Line-of-sight requirements can be hard to meet in marine environments. Try to anticipate what happens when large ships enter the harbor or if a dredging platform blocks the signal path. Mount antennas as high as possible, making sure that your masts are not carrying a lot of weight and are very secure against the wind. When wireless signals cross a body of water, there is a ‘Fresnel’ effect that can create interference. Ideally the antennas should be at least 15’ above sea level, and if you are still having problems rotate both antennas by 90°. Watch out for radar and microwave communications in coastal areas – these are likely to be in the 5.3 GHz band but can create interference in other bands due to high power. A wireless spectrum analysis can show where other point sources are and what frequencies are occupied. Using directional antennas will also help eliminate noise and interference. Winter storms bring power interruptions and sometimes lightening. All wireless masts and camera mounts should be fully grounded and provided with lightening arrestors. Grounded category cable is also recommended. The bigger threat is what happens when the power comes back on. With sudden resumption of power and large demand come surge currents that can destroy electrical equipment that is not protected by a good quality surge protector. Whenever possible, mount cameras under eaves and close in to buildings. If there is an overhang above the camera, you will get much less water accumulating on the camera and it will be protected from the wind. Camera motion in a wind storm can easily render a picture useless. For instance, in December 2007 a powerful wind storm hit the Washington coast. Wind speeds of 140 mph were recorded for over an hour. The storm caused a lot of damage – roofs were blown off, windows shattered, and there was extensive flood damage everywhere. Coastal residents are used to that – they regularly get 60 mph gales, and at least one storm per winter will pack a real punch. Everything is always in motion at the coast. Boats bob, waves roll in, and seagulls circle overhead. Without sensitivity adjustments, the system would record constantly and quickly fill up the available storage space. Use the ‘Noise Sensitivity’ control in your VMS software to filter out fine motion like waves or rain drops from the scene. The “Motion Sensitivity” control is good for controlling the size of the object detected: Humans need to be detected, small animals do not. You can also exclude sections of the picture so that clouds and Sea Gulls are ignored. For more, see our optimizing motion based recording tutorial. Tides are a problem when monitoring floating docks. If you set up the motion detection zones at low tide then go away for a few hours, the previous settings will be invalidated when the tide comes in and raises the platform. The changes can be very dramatic! There is no easy fix for this – just define the motion detection zones to cover the entire range of travel and use the sensitivity controls to filter out wave action and rocking boats. Birds are the number one problem. Seagulls, pelicans, geese, crows, and other large birds will repeatedly trigger a camera. Using a short delay between pre-trigger and alarm trigger will eliminate fast moving flying objects, but there is no good solution when they nest near your camera. Otters and seals like to play on the floats in some marinas. They may be cute and playful, but they also are destructive as any harbor master can tell you. 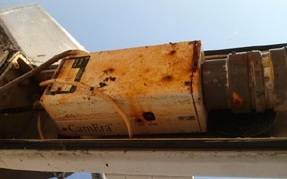 Pan Tilt Zoom cameras are a common choice for marine environments because there is so much area to cover, and only a limited choice of mounting sites. You will want to set up a home position, and also a tour. For example, for a home position the Harbor PTZ’s watch the gangways, but periodically the camera will start up a tour to watch other objects like statues, garbage bins, and the boardwalk along the front of the harbor. At night, we use a schedule to return the camera to a well lighted home position. The tour will be less useful since many areas are too dark to see anything.